THE GRAL FACTORY IN FILO DI ALFONSINE (RA) It derives from a partnership between IBL spa and UNIECO Soc. Coop., important Italian businesses also present in the fair-faced brickwork sector, the new factory for producing high thermal performance bricks for load-bearing walls, infill walls, interior partitions and floor blocks.The factory, which is owned by the GRAL spa company, was built by SACMI, Heavy Clay Division, according to the most modern and innovative design criteria for systems producing brick material.The design and manufacturing of the dies was carried out by TECNOFILIERE.Pictured: strip at the outlet of the extruder. 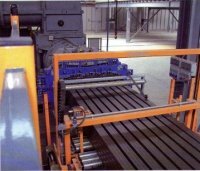 Extrusion equipment supplied by TECNOFILIERE.